Wells, England's smallest city, is a charming medieval city with historic Market Place, many award-winning restaurants, pubs and coffee bars. It is a city of music, with concerts throughout the year at many different venues including the Cathedral. In the centre of Wells, In-B-Tween Cottage provides charming, cosy, newly refurbished, four star rated, self-catering accommodation and is tucked away in a tiny, quiet, cul-de-sac, only 5 minutes walk from the Cathedral and the Bishops Palace. 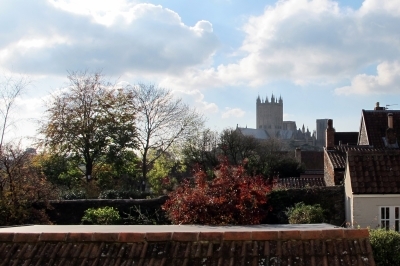 The accommodation comprises three rooms over three floors, with stunning views of the Cathedral from the upper floors. There are two walk-in shower rooms and a well equipped kitchen. The bedroom boasts a king-size bed and the sitting room has 2 chair beds for occasional use. Ideally situated for exploring the Mendip Hills, the Somerset Levels, the magical town of Glastonbury, and Cheddar Gorge with its famous caves and hand-made cheese factory. A few minutes on foot brings you to Tor Woods, and the start of wonderful walking country. In-B-Tween Cottage is a strictly non-smoking establishment. We also have a 'no pets' policy. The cottage has allocated off-street parking and is only 30m from a bus stop in St. Thomas St, with buses into Bath, and to Wells Bus Station (3/4 of a mile away) in Princes Rd. From Wells there are buses to Bristol, Bath, Weston-Super-Mare, Glastonbury, Cheddar, Wookey Hole, and Shepton Mallet. National Express also runs a service from the bus station.